﻿ Check Out The Best Novelties at Maison et Objet 2019! Brand new lighting pieces at Maison et Objet 2019! We have something brand new for you. 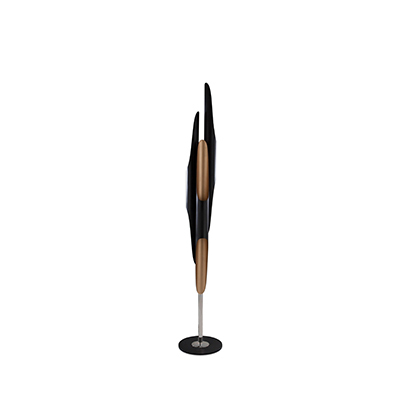 Straight out of Maison et Objet we have a special treat for any modern floor lamp lover. DelightFULL has announced a brand new novelty, Abbey floor lamp. We are going to do a classic first look impression of this brand new floor lighting piece. DelightFULL had two separate Stands for Maison et Objet 2019. They had their classic Stand with all the best sellers and that perfect mid-century setting that makes them appealing. But their second stand was a much smaller one but had an important objective. To showcase the best contract lighting pieces that DelightFULL has to offer. With lighting pieces that feature mixed styles, helping to create a more spread out and varied stand that has the perfect solution for various tastes. Here is the main attraction, Abbey floor lamp, one of many brand new pieces that DelightFULL showcased in their main stand at Maison et Objet. Inspired by the multi-talented Abbey Lincoln, this floor piece has the sophisticated simplicity that best described Abbey Lincoln’s life as an artist. This tripod floor lamp has that mid-century influence, mixed with a contemporary influence that makes Abbey feel like a timeless lighting piece. With two main lampshades, this beautiful lighting piece is a perfect addition to the Heritage collection and a fine stand-alone floor lighting piece that any modern living room would love having. READ MORE: Top Exhibitors At This Upcoming Maison et Objet 2019!